HOUSTON, TEXAS (February 25, 2006) - The recipients of the 2005 US Youth Soccer adidas Coach of the Year Dinner were announced on February 24, 2006 at the Coach of the Year Dinner held in conjunction with the 2006 US Youth Soccer adidas Workshop and Coaches Convention at the George R. Brown Convention Center in Houston. The national adidas Coach of the Year award winners were Fitzgerald Haig of Melbourne, Florida (Girls) and Richard Beal of Ontario, New York (Boys). Houstons Glenn Davis, of the Houston Chronicle and host of the Soccer Hour radio show on ESPN 790 AM, set the stage for the night as the master of ceremonies for the more than 1,200 in attendance. Rear Admiral T.K. Mattingly (USN, RET. ), Apollo 13 astronaut, former shuttle commander and accomplished aerospace industry executive, delivered a powerful message as the keynote speaker of the event. Mattingly spoke to the group of youth soccer coaches, administrators and enthusiasts. Local recording artist Luis Ramirez performed sang and entertained the crowd during dinner. Richard Beal, 2005 US Youth Soccer adidas Boys Coach of the Year, brings 25 years of experience to the Rochester Junior Rhinos Youth Soccer Association of New York (West). In addition to coaching, Beal serves as the Rochester Junior Rhinos Vice President and has served as the past president and coaching director of the Rochester Mavericks Soccer Club. Regardless of his experience, he is known for his desire to constantly seek educational opportunities to further his ability to coach. Beal is known as a mentor to some of the best young players in the area and one that emphasizes complete player development both on and off the field of play. A players mom may have summed it up best when she said, Coach Beal has coached soccer on all levels for over 25 years and we can only hope that he continues for another 25. 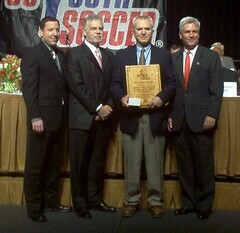 Fitzgerald Haig of the Florida Youth Soccer Association won the honor as the Girls Coach of the Year. Fitzgerald Haig coaches in the Indialantic Youth Soccer Association where his players know when they take the field that they are representing themselves and their coach, and that they are there to play the game they love. They will win with their talent and determination, the same way Coach Haig will tell them to win at life. Serving as head coach for the back-to-back-to-back US Youth Soccer Florida State Champion, Indialantic Force, Haig's players know a thing or two about talent and determination.